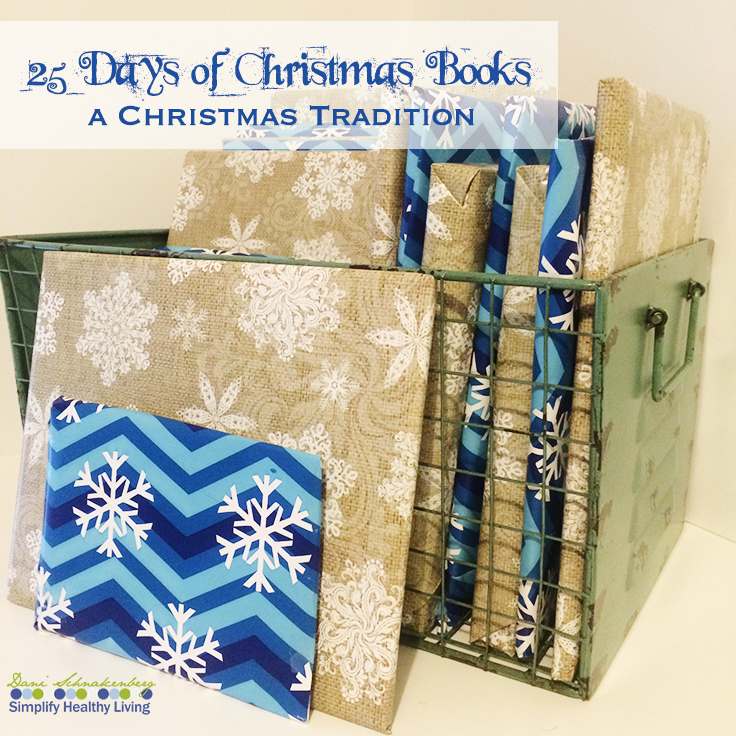 With five young kids, we are constantly on the lookout for new Christmas traditions. We hope that as we try them out over these young years, a handful might stick and become favorites for everyone. I’ll admit that I enjoyed Elf on the Shelf the first year we did it. It was quite fun to think of creative things to do with little Hermie (yes, we let the kids name him). But year two wasn’t nearly so fun. It’s hard to do creative things with them when you have two cats that are likely to mess it up during the night and I think I was just running out of creative juice for it. But this tradition came along with Hermie thanks to my mother-in-law. It was the first year we’d moved away from out hometown and she generously collected and wrapped the 25 books for the kids. After the season was over, we returned the books to her and she did the same thing the following year. Now that we live MUCH further away than we did that first year, I get to do all the wrapping (hubby even helped!). While we’ve read the same set these first few years, I foresee that in future years, a few of the books may rotate as we collect more holiday-themed ones. In the meantime, my mother-in-law has awesome taste in books and it’s been fun to see which ones the kids remember and Josh and I already have favorites that we look forward to reading. And bonus for the two that are recorded books! The kids absolutely adore the two nights that Nanny reads them the book! It’s a great way for long-distance family to share in the warmth of the season even when they can’t be there. Curious about which books we’ll be reading this month? Here’s the list! What are your family’s favorite Holiday books? Oh! I *love* this idea! (Bounced over here from Defining My Happy.) I have a few books that are traditional reads, but we don’t have 25 days worth. Last year I picked up “Holly the Christmas Princess” with the hope that I could sit down with my oldest and read a little over each night, but I’ve not had a chance to pre-read it yet to see if it will hold his interest (he’s 4 1/2). I’m so glad to have this list, too. I’m always looking for good holiday books. If you can find it, Robin’s First Christmas is a sweet little story, although very, very long out of print. And The Snowman and Polar Express are also favorites of ours! Thanks for stopping by, Dakota! I’ll have to look those up, they sound like excellent additions to our collection! I’m actually surprised we don’t have Polar Express yet! Polar Express is one of the first ones I bought actually… I remembered it from when I was a child. Now the message in it makes me cry every. single. time. Ufta. I never watched the movie, but I heard it was an abomination. I found The Night of Las Posadas just last night! I’ve never watched the movie, either. The kids have asked though, so we might. The Night of Las Posadas is such a sweet storie. I’m looking to add a few more multi-cultural ones to our selection, too! What a great idea! I will have to remember this for my future kiddos. What a fun idea! Our kids do the chocolate advent calendars every year and they couldn’t wait to get theirs started yesterday! This is a really cute idea. I wish I had thought of it sooner. I think this is such a neat idea, especially if you have a child who isn’t into reading this is a good way to foster that love of reading! Thanks for the list, Karen! We def love the Jan Brett books!